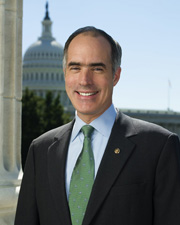 A Senator from Pennsylvania; born in Scranton, Penn., April 13, 1960; graduated College of the Holy Cross 1982; J.D., Catholic University of America 1988; practiced law in Scranton; Pennsylvania auditor general 1997-2005; unsuccessful candidate for governor 2002; Pennsylvania State treasurer 2005-2006; elected as a Democrat to the United States Senate in 2006 for the term commencing January 3, 2007; reelected in 2012 for the term ending January 3, 2019; chair, Joint Economic Committee (One Hundred Twelfth Congress); vice chair, Joint Economic Committee (One Hundred Thirteenth Congress). Daniel Berger Daniel Berger is a senior partner and the managing shareholder in the law firm of Berger & Montague. Alan Buerger Buerger family founded Coventry, a life-insurance company in Fort Washington, Pa.
Aliases Bob Casey, Robert P. Casey, Jr.